As a beginner, when choosing a welder, you mostly look for the best MIG welder for the money; this is because you do not want to purchase an expensive device that will not stand the test of time. Choosing a welder can be difficult as there are thousands out there to choose from. I have brought to you in details all the things to look out for when picking a welder and ten of the best MIG welders available right now. Make sure to buy a welder that best suits your needs because there are different welders for different welding purposes. Now, even if you did not have an idea before, you can know where to start from in choosing a welder. 3.1 Can I use Argon for MIG welding? 3.2 What is MIG welding used for? 3.3 Can I MIG weld with no welding experience? 3.4 What is the difference between MIG welding and TIG welding? 3.5 What can you weld with a MIG welder? 3.6 What is the basic shielding gas for MIG Welding? 3.7 What is the right shielding gas to be used on stainless steel for MIG welding? 3.8 Do I need a spool gun when welding Aluminum? 3.9 Can I use the MIG welder to weld a thick metal? Picking the top-rated MIG welder can be tiring especially when there are a lot of products in the market. 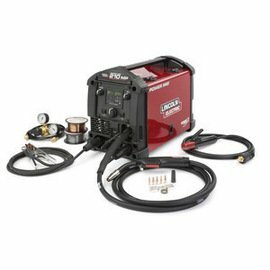 Here is a list of ten MIG welders to choose from, you will definitely find something that closely meets your need. If you are in this line for a long time, chances are you have already used a Hobart welder at least once. That’s because they have been producing welding products for more than a century. The reason they have survived so long is that they do not compromise with the quality, and Hobart 500559 is no exception. What makes the device a bit special is that not only you can use this for MIG welding but also for flux cored welding. With this device, you can work both thin and ticker objects. Thanks to having an amp output of 25-140, you can weld objects from 24 gauges to 0.25-inch thick steel. I like the fact that it comes with a gas regulator from ‘miller.’ For the uninitiated, ‘miller’ is a highly reputed company that makes gas regulators. Needless to say, the regulator is top-notch quality and does a fantastic job. What’s also impressive is the build quality. It’s built toughly and should last a very long time. It’s impossible to say something bad about its performance. You have to see for yourself to understand how great this thing works. No matter if you are pulling or pushing the beads, it feels effortless. Don’t worry if you aren’t skilled at welding; it’s really easy to use even for beginners. This thing runs on the 115V household current which is really nice. However, if you plan on to take this thing out and power it with a generator, then you are in for a disappointment. Because it doesn’t work with a generator. There are a few issues that I’d like you to know about. If you decide to go with this one, then you will be required to get a gas cylinder, which will need to be bought separately. Also, the amount of spool it comes isn’t adequate, so, you would need to get some extra spool of wire. Is this a good beginner model? Ans. For a beginner model, this one is a great choice. Does the unit include upgrades? Ans. Yes, this thing comes with pretty much everything you need. Can this device be used without gas? Ans. Sure, you can. However, you’ll find it difficult to weld thick materials without gas. You’ll be hard pressed to find a company that uses technology more effectively than Lotus Technology in this industry. All their devices include PWM which is a high-frequency inverter technology. That way they are able to produce a constant flow of current to the welding surface. Unlike most of the MIG welders, this thing has a small footprint. So, if you work in-house, or has a small workshop, then it should be your go-to choice. In addition, it isn’t very heavy which makes it easy to take outside for work. However, a power supply is required to run this 110V welder as it’s unable to operate off a generator. Running between 30-140 amps, this device is equipped to weld things that are 24 Gauge – 3/16″ thick. Similar to the Hobart, this one also can handle both Mig and flux cored welding. Overheating and power overload can be an issue for certain Mig welders, but not for this one. Thanks to the thermal cut-out system, the device is immune to these sorts of problems. Hence, you won’t face any cut-out even if you run this thing for hours. The manufacturers incorporated 2 digital displays so that you can control voltage and the speed of wire feeding with superior precision. There’s also a ground cable quick connector which enables it to easily change from positive to negative and vice versa. In terms of price, this thing is really affordable. In fact, this model is one of the least inexpensive MIG welders out in the market. Nonetheless, one thing that bothers me is that it doesn’t come with a gas cylinder. Can this device work without gas? How long is the weld gun cord? Ans. It’s about 8-inch long. Does it require a 15-amp or 20-amp circuit breaker? Ans. 15-amp will do but for continuous use get a 20-amp circuit breaker. Lincoln Electric doesn’t build any run-of-the-mill devices. If there’s one thing you can say about their products, it’s that they offer premium quality and high-end features. Needless to say, these welders will cost you a lot of money. But more on that later. I have already told you that they do things differently. That’s why unlike others they come with dual voltage inputs; 120V or 230V. That means you can take this anywhere you want and power it from any standard power supply. 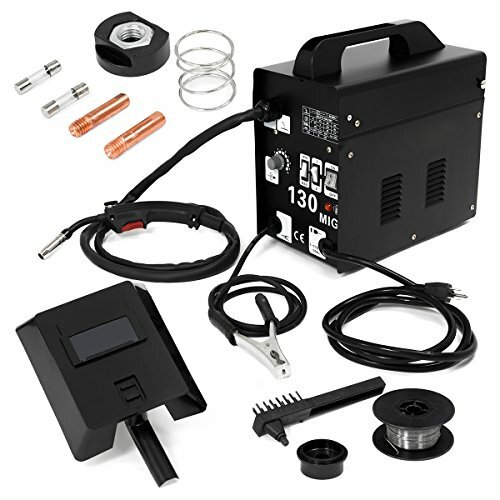 In fact, it’s one of the best dual voltage Mig welder available. But is it portable? Weighing only 40 pounds, it’s 100% portable. It’s impossible to make the set-up any easier. The push and digital turn controls make the entire process a snap. To make the installation more intuitive, they have added a color display to act as your guide. Therefore, irrespective of whether you are just starting welding or a pro at this, it can be an ideal option for you. Being able to run at 210 amps, it allows you to weld both thin pipes and steel tubing of up to 5/16 inch. Also, you are able to operate the unit on either gas or flux core welding. The construction of this welder is highly impressive. Made with sheet-metal, it has been built to last years. Thus, you can rest assured that this thing will serve you for a long time with minimum maintenance. 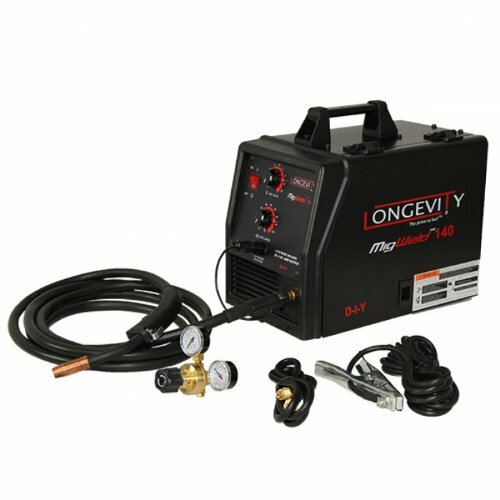 Is the device able to Tig weld aluminum? Ans. No, it can’t. This device is DC only. Is the body made of plastic or metal? Ans. Both plastic and metal have been used to build the appliance. Niels Miller, the founder of the company, created the first device from recycled scrap steel that he found in his basement. Though it started as a one-man company, it has grown to be one of the biggest manufacturers of arc welding equipment. It goes without saying that they are one of the most reputed companies in this industry. I find the auto-control fascinating. It enables you to relax as the machine sets itself to the right parameters. No need to get disheartened if you are a fan of manual mode. The machine also features a manual mode which allows you to set things by yourself. No plastic has been used to build the body as it’s entirely made of metal. Not only it makes the machine long-lasting, but it also gives the device an attractive look. I know aesthetics doesn’t matter in a welding machine, but being nice-looking doesn’t hurt. Right? When it comes to welding aluminum, it’s capable of working on materials that are as thick as 14-18 gauges. However, if you are welding mild steel, it can weld materials from 24 gauge to up to 3/16 inch. The device operates on 120V which can be found in regular households. It would have been better if the device had dual voltage inputs similar to the Mig welder from Lincoln Electric, but 120V is good enough. Smooth is the word I would use for the way the drive roll assembly adjusts itself for various wire sizes. Moreover, you will be glad to learn that just like other welders, this one also supports both Mig and flux cored welding. Why does the unit include gas gauges? Ans. To allow you to use shielding gas for welding. What wire should I order for gas welding? Ans. The machine comes with a roll of wire. Nonetheless, you can get a roll of flux core if you have outside welding in mind. Can the machine use 220V input? 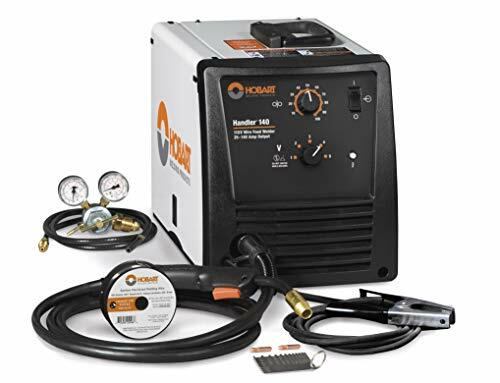 If you have budget constraints and looking for a quality welder at an affordable price, then this one Might be your best bet. It comes from Forney, which is in this business for over 80 years. The company is renowned for producing top-class welding equipment at an affordable price without sacrificing quality. Performance-wise, there’s nothing you can complain about. On the contrary, it deserves a lot of appreciation. The welding machine produces a clean cut and lets you perform spatter-free welding. One of the most significant features of this unit is its duty cycle. 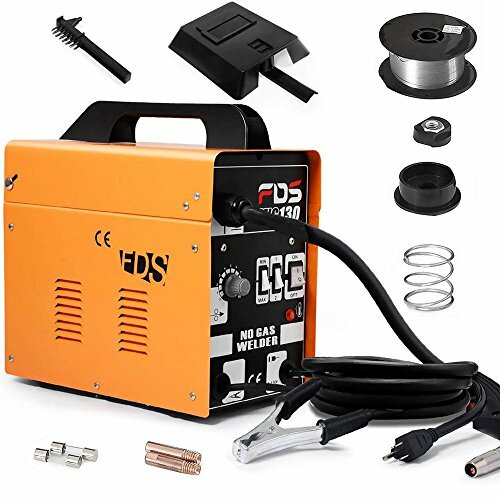 It’s incredibly good and allows you to do welding for a long time without a hitch. Unlike cheap MIG welders, it doesn’t turn off midway through the welding process to cool down. Though the unit features a hose and a gas regulator, it doesn’t come with a gas tank. I must warn you that gas cylinders can be really expensive in certain areas and can cost you hundreds of bucks. Nonetheless, you can also do some flux cored welding with this one. If you value portability, I’m afraid this one might not be the right choice for you. That’s because this thing is pretty heavy. However, that’s not necessarily a bad thing as it means the device is really well-constructed. So, it’s up to you to decide if you are willing to barter portability for great construction. Regarding material thickness, it can weld from 1/16” up to ¼ inch steel. That’s really good considering the low price. Have I told you that this thing is made in Italy? Probably not. Not that it’s a bad place to make welders, but the language barrier makes the instruction manual a bit less helpful. What is the minimum amp? Is a spool gun compatible with this device? Can I use this machine without gas? Ok, I must admit welding machines (good ones) do not come any cheaper than that. The price is insanely low for a welding appliance. 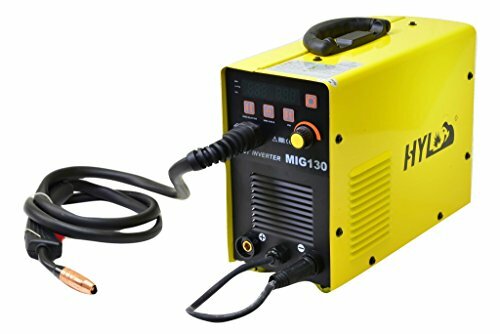 Granted, it’s not suitable for professional works, but it’s certainly one of the best Mig welders for home use and occasional repairing jobs. Concerning portability, it’s the complete opposite of Forney 309. This thing is small, takes up very little space and weighs a lot less than the others. In short, it’s the perfect welder machine for carrying along with you on an outdoor task. The unit features two air bent on the device to tackle thermal issues. They facilitate heat dissipation and enable the machine to remain cool. In addition, the gun comes with on/off safety control so that you don’t start the device accidentally. With the help of a knob, you can adjust the wire feeding speed. There are ten different levels of speed which allows you greater control over the machine and the entire welding process. So what’s the catch? Well. There’s one. It’s not a Mig welder. Yes, I know that it’s called a MIG welder, but the name is somewhat misleading. Despite being called a MIG welder, it’s unable to do Mig welding. That said, due to being one of the best gasless Mig welders out there, it has earned a place in my list. The build quality is one of the best in the market. If you ask me how the device was constructed so well at such a low price, I really don’t know the answer. Well, probably being made in China and cheap labor has something to do with it. How long is the cable of the welding gun? Ans. It’s about 76″ long. Does the unit come with a mask? Ans. Yes, it does. The mask is made of plastic. Are replacement tips easily obtainable? If you compare this one with the Arksen Mig-130, you would be forgiven to think that both are the same products. From the design to the specifications, they have several similarities. But that doesn’t mean that Goplus Mig 130 doesn’t offer anything new. Due to having several interesting perks, it merits a place on this list. The variable wire feeding speed control allows you to adjust according to your power intensity levels. Moreover, the four heat settings are also an amazing feature, which helps it to stand out among the budget options. Built with steel frame, the device looks pretty nice. Though the handle is made of plastic, it doesn’t take any shine off its design. Also, the device is meant to last years and has been built really well. I am sorry to disappoint you, but this is no Mig welder. Just like we have seen with the Arksen Mig-130, the name can be misleading. And that’s what happened in this case as this machine can’t support Mig welding process. Hence, you’ll have to be content with only flux core welding. The upside of not being able to gas welding is that the manufacturers can sell it at a very low price. 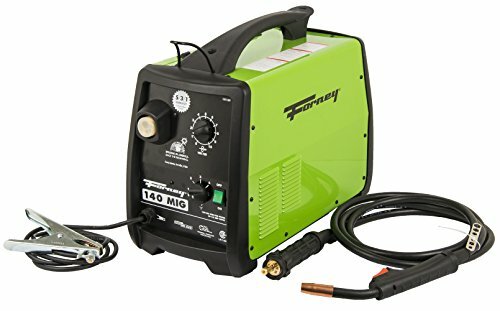 Priced at just over 100$ it’s one of the most affordable welders out there. There’s a face mask that comes with the package. However, I’d strongly suggest that you upgrade the face mask if you intend to use the machine regularly. That’s because it’s just a piece of plastic and more suitable to work as a shovel rather than a mask. Is the machine able to weld 1-inch square tubing? Is the device AC output? What sizes of wire can the device handle? Ans. .030 and .035 should be fine. XtremepowerUS is a huge company and mainly known for manufacturing various home equipment. Nevertheless, their most popular product is welding machines. For this reason, you can remain assured that this one will be of great quality. Being a budget-option, it has a low price tag, which makes the device very affordable. Nonetheless, the manufacturers didn’t resort to cutting corners to keep the price low. Granted, you won’t get the features of a Hoover or Lincoln Electric, but the device is on par with all the other inexpensive options in terms of quality and performance. The manufacturers gave a lot of effort to make the setup process as effortless as possible. Even if you have no prior experience with welding equipment, you will find it very easy to set the machine up. When it comes to welding current, 50-120 amps is neither bad nor extraordinary. However, the fact that you can adjust the wire speed is certainly admirable and makes the device more versatile. It’s one of the lightest welding machines out there at just 36 pounds. That makes the device extremely portable. What’s also impressive is its duty cycle which is 10% and 35% at 105 and 60 amp respectively. Regarding wire capacity, you can use either 0.030″ or 0.035″. Keep in mind that this device isn’t capable of gas-welding, and only able to do flux core welding. Can this machine weld automotive sheet metal? Do you need gas to run this thing? Is it possible to weld aluminum with this one? The USP of HYL is that they provide an ample amount of value for the money. Their products are always filled with attractive and useful features. And the best thing is these welders won’t cost you a king’s ransom; rather they come at a competitive price. Only a glance is enough to tell that this one is no ordinary welder. Unlike others, it’s three-in-one welder which supports Mig/Tig/Stick welding. That makes the machine extraordinarily versatile and opens a lot of options for you. I must mention that this device is amazing at welding. Produces a stable arc and almost eliminates splatter. Considering the price, its performance makes the deal a no-brainer. Moreover, due to having a very low weight, it can be considered as one of the best portable Mig welders in the market. According to the manufacturers, the welding device has a high duty cycle. Well, I find myself agreeing with them as the machine indeed has a really good duty cycle. You shouldn’t have any problems running the machine for a prolonged period. As regarding the construction of the body, it’s pretty good. Not that it is as good as the high-end welders, but it should certainly suffice. You can expect a couple of years of service from this one easily. It’s worth mentioning that one or two consumers have complained about the gas welding. Nevertheless, in my opinion, those problems most likely occurred due to their inexperience with the welding process rather than something to do with the device itself. Does the unit include a gas regulator? Ans. Yes, but doesn’t come with a gas tank. Does the package contain a Tig foot paddle? Is the wire roller plastic? Ans. No, it’s made of metal. Longevity, the name of the company and the word can also be used to describe their products. Their products are designed to survive and can endure years of rough use. Not that you won’t have to replace parts, but they won’t need frequent replacements. What struck me most about the device is that it’s incredibly easy to operate. That’s a huge plus if you aren’t proficient in the welding process. Also, you will find the setup very simple, and it shouldn’t take more than a couple of minutes to get the machine started. The Mig welding device can weld steel up to 3/8″ thick. If you take the price into consideration, it seems more than impressive. Moreover, the duty cycle of the device is 20% at 90 amps. That means you can run the machine for about an hour without any issues. Unfortunately, the device is a bit heavy and big. So, you must consider if you have enough space for the Mig welder before you make any decision. That said well-constructed devices are usually a bit heavier. There are a few things that I didn’t like about the welder. The pressure gauge and the flow gauge aren’t up to the standard and will probably need replacements after a year. On the front, the plastic bezel is susceptible to being warped from the heat of the sun. It’s great that the unit keeps the door open for both Mig and flux core welding. Unlike some budget models, it does Mig welding just as well as it’s advertised. What things do I need to weld aluminum with this device? Ans. A spool gun and a gas cylinder filled with argon gas. What size wires come with the unit? Does a regulator come with the package? 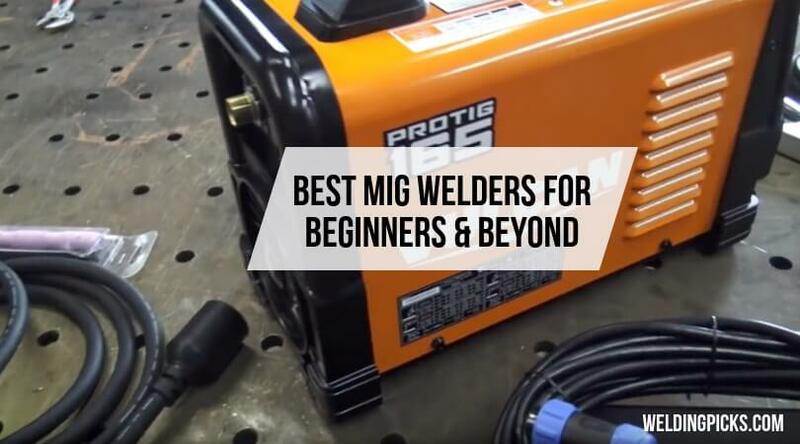 If you are a beginner and trying to learn how to MIG weld either steel or aluminum; getting a MIG welder is the best place to start as it is very easy to learn. 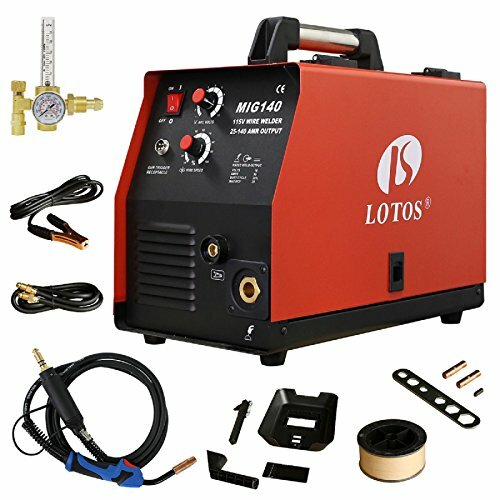 Before purchasing any MIG welder; make sure to look for some critical features that fit what you intend to use it for so you do not waste your money. 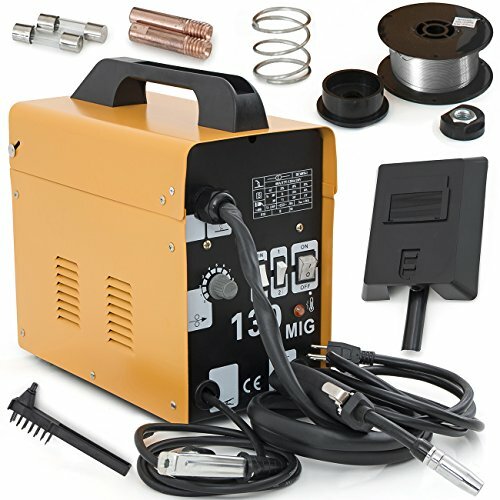 Here are some of the features to look before buying any MIG welder. A flux-cored welder produces a protective covering from a compound included in the wire itself. This produces a lot of spatters and slag coating around the weld that must be removed. There are some welders having shielding gas which helps to keep oxygen away from the weld. These welders produce a clean weld and you can better view weld puddle. Does the welder have AC or DC power supply? 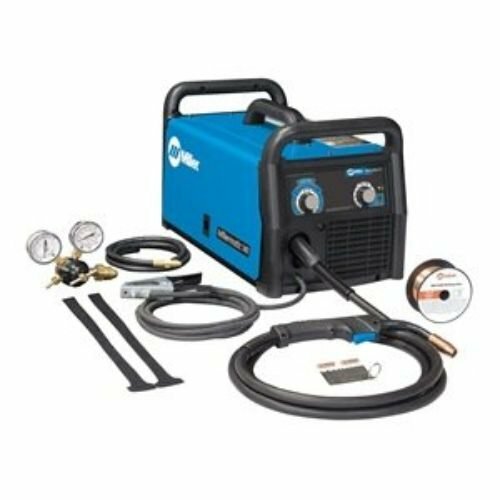 AC power supplied welders do not allow for much flexibility to make custom cuts and are relatively cheap. DC power supplied welders allow for different cuts because they come with extra electrodes, but they are expensive. Some welders come with both, which is the best option to get if you can afford it. Depending on the type of project, you will need to know the wire feed speed of the welder you are getting. Because the feed speed affects the amperage and also the amount of weld penetration. For DIY welders, the feed speed has to be manually set, but more expensive welders have automatic adjustments for the feed speed. The wire size you will use depends on the type of material that you want to weld. A thicker wire is used for a thicker material and thinner wire for a thinner material. So make sure to check the MIG welder for the recommendations on the type of wire it can use. You should consider if you will need to move the welder about. If this is the case, you need to get a welder with a wheeled cart to ease the stress of moving it around and reduce any strains to the back that may result from lifting such heavy equipment on a regular basis. Depending on how long you will be welding for; check out the amperage and duty cycle of the welder. The amperage of a welder is the amount of heat it produces while the duty cycle is the duration during a ten minute period that the welder can operate on particular amperage before it starts to overheat. The higher the duty cycle, the longer the time you can spend welding. So if you intend to weld for long hours working on a thick metal; ensure you get a welder with a high duty cycle to avoid overheating and damaging the welder. It is important to choose a welder with a thermal overload protection regardless of why you are getting the welder. Depending on the duty cycle; if you weld too long, the welder can start overheating. Having a welder with thermal overload protection saves you from experiencing the problems of having your welder overheat. This is something like a warranty on its own because it reduces the risk of you damaging your welder from overheating. Welders do not come cheap; make sure whatever welder you are getting comes with protection on your investment just in case there are issues with the product. Most welder manufacturers give a warranty to replace the product or return your money for any defective product. If you intend to work with a spool gun, ensure you check that the welder you are getting allows for a spool gun to be hooked to it. This type of welder allows for welding of aluminum; not all welders have this option. So, be careful to check for this feature on any welder you intend to get if you want to weld aluminum. Can I use Argon for MIG welding? Yes, if you intend to weld a non-ferrous metal, you will need to use 100% argon. Metals like aluminum, magnesium or titanium require pure argon. This type of welding is used to create strong and durable joints. Can I MIG weld with no welding experience? Yes, you can, MIG welding is the easiest welding to learn and is the most versatile. The major difference between these two welding process is that MIG uses a continuous feeding wire while TIG uses long welding rods by slowly feeding them into the weld puddle. What can you weld with a MIG welder? You can only weld thin to thick metals using MIG welders. What is the basic shielding gas for MIG Welding? Argon is the basic shielding gas for MIG welding, although Helium can be used in addition to argon to increase the penetration and fluid of the weld pool. What is the right shielding gas to be used on stainless steel for MIG welding? A mixture of three gases such as Helium (90%), Argon (7.5%) and Carbon-dioxide (2.5%) is the recommended ratio of shielding gas to be used to weld short circuit stainless steel. Do I need a spool gun when welding Aluminum? No, you do not need a spool gun to weld aluminum. You can use Teflon liners or special drive rolls. Can I use the MIG welder to weld a thick metal? I really do hope you can now make an informed decision when choosing the best MIG welder for the money. The welders listed above do not require you to be an expert welder to know how to operate; in fact, they are very easy to use. Watch out for the features that best suit your welding needs; these devices are pricey, but you would not want to buy the machine that cannot weld the metal you intend to weld.